Have you ever been impressed by the 19-year old Kylian Mbappé who is a French professional footballer? He plays as a forward for Paris Saint-Germain, on loan from Monaco, and the France national team. In World Cup 2018, he made a history and successfully turned the world eyes on him. He is a superstar and the greatest footballer ever. I am a huge fan of him so I plan to download World Cup videos about him in my personal computer and if possible, I would like to merge all my favorite photos about him into a slideshow. Is there any program suite capable of downloading, merging, and editing videos for me in one stop? Lucky you! Here is a powerful program suite called Leawo Prof.Media that is fully capable of achieving all downloading, editing, conversion, and merging tasks in one stop for you. To begin with, you can download any videos from YouTube freely with the help of Leawo Video Downloader, a part of the professional suite Leawo Prof.Media. With it, you can freely download videos and music from more than 1000 sites. Downloading videos from facebook with Leawo Video Downloader is also as simple as ABC. To make it better, HD downloading is supported. Here is a guide to show you how to succeed in football World Cup download from YouTube using this program. Step 1: Make sure you have this program installed correctly on your PC. Copy and paste the URL via the built-in search engine to locate your World Cup videos or simply enter the key words on the quick search box to find it. Click on the gear wheel icon on the top right to enter the settings interface, where you can perform smarter settings here, such as max download tasks, directory to save the downloaded videos, and so on. Step 4: Download videos from YouTube. Click the arrow icon to download your favorite video. More than one video can be selected in parallel. Step 5: Check out the downloaded video. 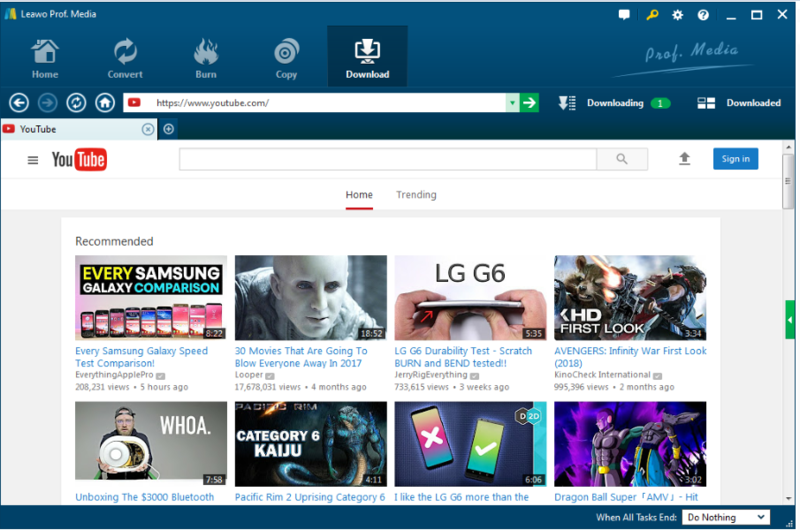 Check for the ongoing downloading task from the Downloading tab and once a video is downloaded successfully, check it out from the Downloaded tab on the toolbar. I am pretty sure you have downloaded the World Cup videos thanks to the help of Leawo Video Downloader. Here you could go on to edit and merge your World Cup videos. From the Leawo Prof.Media suite, you may notice there is a Leawo Video Converter. Yes, this is exactly what we need to use in order to edit and merge videos. 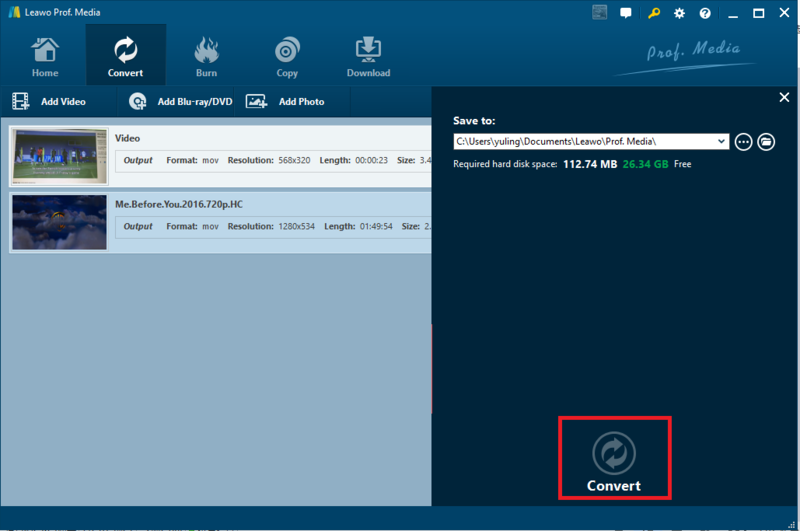 It is professional video converter intended to convert videos from one format to another, covering 180+ formats in total. The conversion speed it provides is 6X faster than any other program in the same category. Don’t worry about the output file quality as it is able to perfectly preserve 1:1 quality after file conversion. Do as the following procedure to edit and merge your World Cup videos with this program. Step 1: Launch the program and add videos to the program. 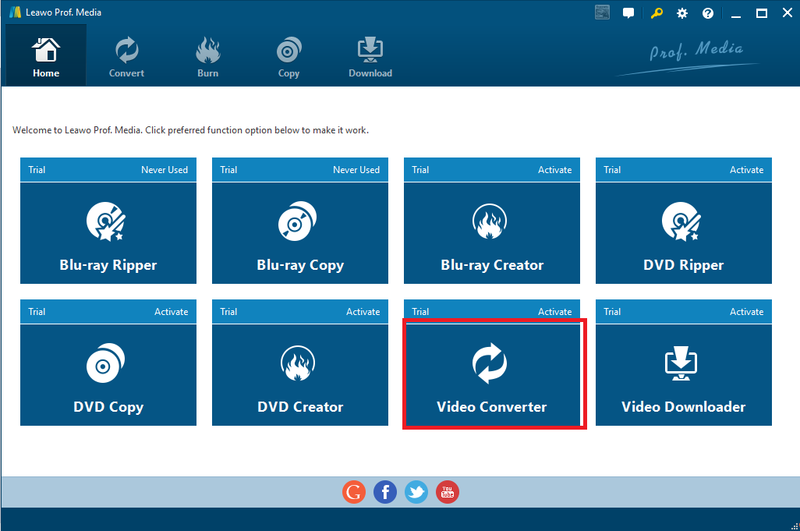 Hit on Video Converter and click Add Video to add your videos here. Step 2 : Edit the video. Click on the editing icon to edit the World Cup video based on your preference. Trimming videos, cutting videos, setting saturation, contrast, brightness, watermarking, and adding effects are supported here. Step 3: Merge World Cup videos into one file. When editing your video is done, click OK to exit and return to the home page. Then click the merge icon on the toolbar to merge videos into one file. Step 4: Set a directory to save the edited and merged video. Since we do not intend to convert the World Cup videos to another format, just leave the output format as they are and click Convert. Here you could set a directory to save the edited and merged video. Then, hit on the big round button Convert at the bottom to kick off the process. Step 5: View the progress and open the edited video. View the progress with the help of the green progress bar and once a video is successfully converted, you can click on the folder icon to open the folder where the converted video is saved. Leawo Video Converter is a perfect video converter and video editor for you to edit and merge videos, what if you want to achieve more, like turning a series of photos into a slideshow for better enjoyment? Here are a few tips for you to do that. Step 1: Open the video converter page and click Add Photo or Add Photo Folder to import your favorite football star photo here. Step 2: Click on the editing icon to edit the slideshow. Video and audio options will be displayed on the left sidebar. You could set video effects such as photo duration and transition duration, and add background music to the slideshow. Step 3: Set a directory to save the slideshow. Go back to the home page when all settings are done, click the big green button Convert and set a directory from the pop-up sidebar to save the slideshow. One thing to note is you could set an output format for the slideshow before starting to process the file. Then, click Convert to kick off the process. Step 4: Open the slideshow. View the green progress bar to keep in track with the process completion status. When you see 100% is done, a folder icon will be shown, on which you can click to open the folder and play the slideshow just made. Now you see, this professional program suite is so powerful that it is fully capable of fulfilling tasks of video conversion, editing, downloading, merging, and making slideshow in one stop. Try it out for the World Cup final video. I am sure you will love it as much as I do.